Life can be tough, especially with the constant barrage of obligations, news, work, family events. It can be hard to find yourself and God through all the chaos. J. 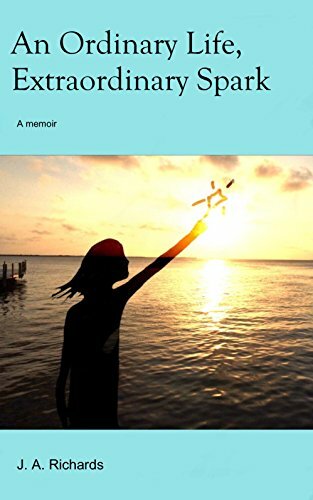 A. Richards’ memoir, An Ordinary Life, Extraordinary Spark, takes the reader through her spiritual journey and how she found God in the quiet, the mundane, the ordinary. While the author’s life is seemingly ordinary, her retelling of her dad’s death and its impact on her life shows how God works with and through ordinary people and events to make extraordinary things happen. How many people can say that the post office almost lost their dad? And say that with humor and grace? Only J.A. Richards, and only in this memoir. Although Richards’ recounts several other life events along the way, including her bumpy at-times faith journey, she also offers some tips and tricks to the reader so they can hopefully learn from her ridiculous (and sometimes painful) mistakes, and she does all of it using a humorous voice with a positive message. As J.A. Richards mentions, she is just happy if she can create a spark for your own spiritual journey, and she hopes that you can listen for God in the quiet too.